Delta Hydronics provides preplumbed and skid packaged chiller and heat transfer systems for commercial and public institutional aquatic cooling applications. Typical skid chilling applications include single tank systems, single pass flow through designs and multi-tank recirculating applications. 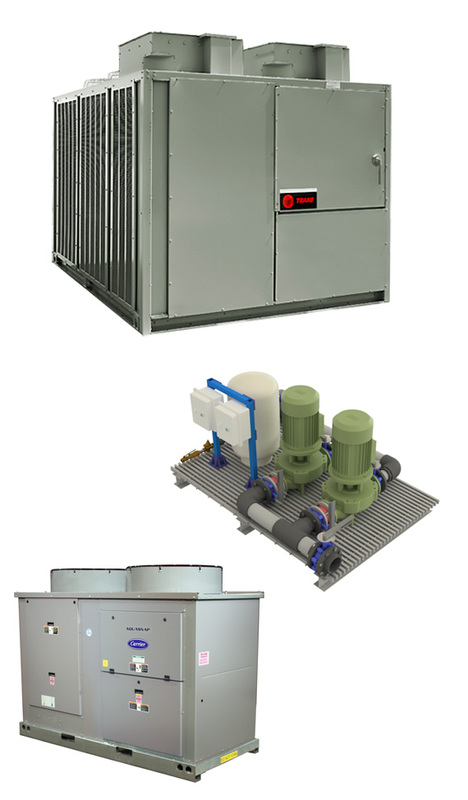 All skid systems include single or dual chillers, immersion or plate style heat exchangers as well as all necessary components required to provide a complete chilling solution. Single or dual air cooled R410 refrigerant chiller units packaged with immersion grid coil or plate and frame heat exchangers properly sized for your specific cooling load application. Chiller unit includes heavy gauge powder coated galvanized cabinet, beige urethane finish, multiple scroll compressor design, insulated carbon steel plate heat exchanger evaporator with brazed 316SS plates, 3/8" seamless copper tube air cooled condenser coils with aluminum plate fins, multiple condenser fans utilize direct drive ODP weather resistant motors, Trane CH530 digital control system indicating modes of operation and failure through digital display. Chiller may be ordered with optional condenser heat recovery for secondary water heating applications. Heat exchangers can be either plate and frame or immersion grid coil design constructed of either titanium or stainless steel materials based on your aquatic chilling application. Heat transfer surface area is calculated based upon the heat transfer coefficient of preferred material, system flow rates and anticipated fouling factors. Alternative heat exchanger materials such as polypropylene and polyethylene are available. The chiller and heat exchanger loop is pumped by a properly sized CPVC, bronze or steel pump and selected based on heat exchanger design and distance from boiler skid. A secondary pump may be needed if chiller is located far from heat transfer skid. Preplumbed piping package includes all copper or schedule 80 piping on the closed chiller loop as well as schedule 80 CPVC pipe on open aquatic system side. Air controls include air separator, expansion tank, air vents, and pressure reducing fill valve. Temperature control a includes a digital temperature controller with 15' lead titanium encapsulated temperature sensor. All heat transfer components (pumps, plate heat exchanger, air controls, electrical boxes, and temperature controls et.) are preplumbed and skid mounted on a corrosion resistant fiberglass reinforced polyester grated skid assembled on 4" fiberglass "I" beams. Systems are preplumbed, factory wired, skid assembled and leak tested for ease of customer installation. Crated skid delivery is typically four to six weeks. Optional Buffer Tanks available sized at 3.5 gallons per ton. Buffer Tanks are typically used in low volume loop applications where short cycling and compression unloading may be an issue. Tank sizes range from 70 to 500 gallons pending applications. DHCXP-020 020 CHILLER SKID Single 20 Ton Chiller and Heat Transfer Skid Package 20 TON B.O.M. DHCXP-026 026 CHILLER SKID Single 26 Ton Chiller and Heat Transfer Skid Package 26 TON B.O.M. DHCXP-030 030 CHILLER SKID Single 30 Ton Chiller and Heat Transfer Skid Package 30 TON B.O.M. DHCXP-040 040 CHILLER SKID Single 40 Ton Chiller and Heat Transfer Skid Package 40 TON B.O.M. DHCXP-052 052 CHILLER SKID Single 52 Ton Chiller and Heat Transfer Skid Package 52 TON B.O.M. DHCXP-060 060 CHILLER SKID Single 60 Ton Chiller and Heat Transfer Skid Package 60 TON B.O.M. DHCXP-070 070 CHILLER SKID Single 70 Ton Chiller and Heat Transfer Skid Package 70 TON B.O.M. DHCXP-080 080 CHILLER SKID Single 80 Ton Chiller and Heat Transfer Skid Package 80 TON B.O.M. DHCXP-090 090 CHILLER SKID Single 90 Ton Chiller and Heat Transfer Skid Package 90 TON B.O.M. DHCXP-100 100 CHILLER SKID Single 100 Ton Chiller and Heat Transfer Skid Package 100 TON B.O.M. DHCXP-110 110 CHILLER SKID Single 110 Ton Chiller and Heat Transfer Skid Package 110 TON B.O.M. DHCXP-120 120 CHILLER SKID Single 120 Ton Chiller and Heat Transfer Skid Package 120 TON B.O.M.